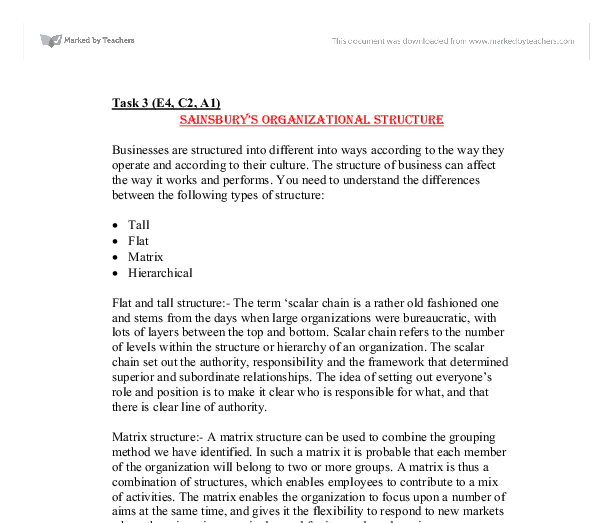 Task 3 (E4, C2, A1) Sainsbury's organizational structure Businesses are structured into different into ways according to the way they operate and according to their culture. The structure of business can affect the way it works and performs. 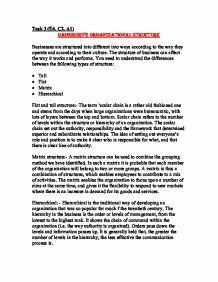 You need to understand the differences between the following types of structure: * Tall * Flat * Matrix * Hierarchical Flat and tall structure:- The term 'scalar chain is a rather old fashioned one and stems from the days when large organizations were bureaucratic, with lots of layers between the top and bottom. Scalar chain refers to the number of levels within the structure or hierarchy of an organization. The scalar chain set out the authority, responsibility and the framework that determined superior and subordinate relationships. The idea of setting out everyone's role and position is to make it clear who is responsible for what, and that there is clear line of authority. Matrix structure:- A matrix structure can be used to combine the grouping method we have identified. In such a matrix it is probable that each member of the organization will belong to two or more groups. A matrix is thus a combination of structures, which enables employees to contribute to a mix of activities. The matrix enables the organization to focus upon a number of aims at the same time, and gives it the flexibility to respond to new markets where there is an increase in demand for its goods and services. Hierarchical: - Hierarchical is the traditional way of developing an organization that was so popular for much f the twentieth century. The hierarchy in the business is the order or levels of management, from the lowest to the highest rank. It shows the chain of command within the organization (i.e. the way authority is organized). Orders pass down the levels and information passes up. It is generally held that, the greater the number of levels in the hierarchy, the less effective the communication process is. ...read more. As they know the inner constraints, strengths of that particular segment. (C2) Relationship between structure, culture and management style Organizational Structure: - This is the pattern of work roles and the ways of administration of the organization within the set of duties, responsibilities, following the rules and regulations, so businesses are structured in different ways according to the way they operate and according to their culture. Culture: - Culture of an organization is set of behaviors and value system that characterizes an organization. So organization culture is very much related with the way people in the organization interact with each other. Management Style: - The management style is the typical pattern of behavior of the manager, which he or she performs while performing management roles. So management style on the other hand effects the gripping of power approach towards subordinates and implementation of the work mechanism. Work culture is directly affected by the organization structure as it takes the rules and regulations, duties and responsibilities from the organization. Similarly management style is also affected by organization structure because the management style depends upon the degree of authority responsibilities vested in the hands of the manager. The duties and responsibilities authorize are strictly defined in the organization structure. For e.g. in Hierarchy structure or tall organization structure management style will be mixture of autocratic. In decentralized organization the structure the management style will be democratic and in the flat organization structure the management style will be consultative because the number of persons to be managed will be very few and easy to managed. Culture Organization structure Management style Role Functional structure Democratic Power Centralized structure Autocratic Task Matrix structure Democratic Person Centralized Autocratic Similarly the organization culture is also having the impact upon the management style and organization structures. If there is a power culture prevalent then there will be the centralization of power, management style will be autocratic and organization structure will centralize. ...read more. This is often referred to as the 'grapevine'. This can be concerned with the content of the jobs (e.g. two employees commenting on the poor performance of a task by their superior), or it can be discussing non work-related matters. (e.g. arranging a staff social function). Verbal and horizontal communication Communications can also be classified in terms of direction, vertical or horizontal. Vertical communication can be top-down (e.g. directions and instructions given from superior to subordinate) or it can be bottom-up (e.g. feedback from subordinate to superior). Horizontal communication refers to contacts and flows of information between people at the same level in the business. Where there is no facility for feedback, (often under an authoritarian management style then this is referred to one-way communication. There is a danger here, however that the message will be misunderstood or poorly performed, since the employee performing the task is unable to ask his superior for assistance or clarity. It is widely held view among many businesses today that communication must be multi-directional (i.e. top-down, bottom-up and vertical-horizontal) in order to involve employees and make them feel valued by the business (e.g. implementing systems of quality circles or work councils). This will help to improve their job satisfaction and level of motivation, as well as encouraging lower rates of absenteeism and Labour turnover. Open and restricted communication It is important to identify the purpose of message with any form of communication. Open communication refers to the message, which is to be targeted at everyone within the business, or groups outside the business and does not contain confidential materials. (e.g. notice boards, memos to all staff or staff magazines, etc). On the other hand if the message contains confidential materials, and it is only targeted at specific person or group either within a particular business or at a certain level of seniority, so that its use is restricted. That is known as restricted communication. (e.g. college staff meeting where students are needed, or a letter saying private and confidential etc). ...read more. ***** Parts of this are excellent showing good evidence or research into the theory and what the actual situation at Sainsbury's is. Other parts look lifted from textbooks. be more attractive, then Tesco has to improve of their store to make it attractive. SWOT analysis Strengths I believe Tesco's strengths are it can offer several of service to customer to increase customer's satisfaction this is mainly because Tesco have the resources and the money to do it. It both insulates and removes unwanted moisture from the bag keeping the pizza crisp and hot. This will boost sales as there customers will know there pizza will hot when it arrives. The "spoodle" was an invention by Jeff Goddard who is the world fastest pizza maker. a benefit of being Market Research manager Ian Roberts also gets a discount on his products whenever he shops at Asda. Duty Manager The Duty manager James Davis Is responsible for a variety of things but he is mainly in charge of the stock and the warehouse. Hygiene factors are factors which 'surround the job' rather than the job itself. For example a worker will only turn up to work if a business has provided a reasonable level of pay and safe working conditions but these factors will not make him work harder at his job once he is there.